Today was just glorious so we went to sun ourselves at Tatton Park - no point having a statley pile within a reasonable drive if you don't go and sit in the gardens and pretend to be Lady of The Manor every now and again. The slats remind me of the Nigerian Egungun costumes I am using as a basis to design my City and Guilds bag. However, I was also taken by the scarecrows, who are not part of the art exhibition but just as good. And ripe for applique, no? That last one with the face looked so much like a mad music teacher that it made me think - wouldn't it be fun to make the scarecrows like famous people - who is for a raggedy George Bush on a stick? I saw sense with my previous over optimistic designs when I tried to print out foundation patterns - anything you can piece does not fit on an A4 piece of paper! Besides, these African fabrics don't need overcomplicating ( so I tell myself.) So I dropped down to simpler New York Beauty Blocks. These are a few of the 6 inch blocks so far. I intend to vary the colour placements and add some new colour 'families' including greens - these are just the start! The photos throughout this post are of the quilting on this quilt which need a title and fast, as the entry form for Festival of Quilts needs to be posted on Wednesday. Any ideas? My best one so far is Last orders down the Watering Hole but Dennnis doesn't think much of that one. I had fun making all the leaves different. I have always wanted to go on a quilt retreat but frankly even the plava of getting my gear up to the regular class I do in Penrith is wearing. I dread a flat tire on the motorway - can you imagine the pile on the hardshoulder as the RAC man gets the spare out. ( No, there is not a snowball in hell's chance that I will be getting it out!) Machine, extension table, two project boxes, show and tell quilt, basket of notions and leads, overnight bag, quilting journal, pile of magazines for my friend. .... and add shopping to that on the way home. And really, quilting in good company is delightful but it doesn't really go with top productivity does it? But this Bank Holiday weekend I have well and truly solved the problem. My quilting retreat started on Sunday. My husband drove me to Manchester airport and I had no need to tote anything other than my purse. Check in went smoothly, we had a coffee and then, at time to go through security I left him there and came home. Save for a few phone calls to check he is enjoying a visit to his parents' in Northern Ireland I have the best part of four days splendid isolation to quilt to my hearts content. The general pattern is: Get up, read quilt magazine over breakfast, work on the machine with short breaks to make tea and sandwiches until hunger drives me to the freezer for tea. Eat in front of TV then handsew in front of TV until eyes will stay open no longer. So the productvity is fine. As for company. well, fortunately I like my own, but as TV includes catching up on unwatched episodes of The Quilt Show I can say that I shared my double egg, chips and beans (come on I am not wasting time on food!) with Ricky Tims and Alex Anderson. Aaprt from this quilt I have been doing samples and also a lot of design work for one of my City and Guilds final projects - a bag set based on Nigerian Egungun ceremonial costumes. Would you like to see my design book pages sometime? On Thursday I have a break to prevent RSI setting in and to take my Mum shopping for clothes and then I have a Friday to Sunday weekend to get more done! I have a list which I pared down to make achieveable but I still think I'll be doing well even with all that time! What does a girl with a new CD Rom drive, a not much to do at work and only football on TV in the evening do with herself? I am actually going to attempt somthing like one of these designs - the fabric is collected ready for a quilting group on Saturday in Penrith. It might need one or two additions though....! Turns out they can put a new DVD drive in my laptop for £70. And do it in 24 hours, so no major disaster... but of course by the time I got to PC world I was quite looking forward to a new shiny laptop. Oh well. But of course now I can't do any of the work I should be doing because they have my all my document files (and I am pretending that I don't have them all backed up on a removable disc and easily transferred to Den's laptop.... ). So I'm off to quilt. Midafternoon. I was a goodytwo shoes and never played truant at school but I think I am geting to know what it would have felt like! At the Quilts UK show I bought the CD ROm that goes with the Karen K Stone book so that I could print out the New York Beauty and Cinco De Mayo quilt blocks via EQ5 onto foundation paper. So, I take my breakfast to the laptop in order to sneak in quilt time before work and... does it work? No it does not. Nothng wrong with the disc but my computer has forgotten it has a CD drive. It's just not there anymore. I mean the drawer that slides in and out is there but the hard drive doesn't know it. Restarting did not work. Shouting at it , "But I need these foundations for class on Saturday" does not work. Sigh. Off to make sure all my files ore backed up. My recent silence was due to two trips. First. on Thursday night up to Penrith for a Chambers event the next day. Of course stayed at my parents and seized the opportunity to put my head together with Dad's to design a hanging system for the hall. I thoroughly enjoy the brainstorming of possibilties with him. But, I confess, once he starts being specific about widgits and thingummies I have to make him come to the hardware store with me. Of course once we got there we saw a product that made us re-design on the spot! I think our ideas were clearer in our heads than on our sketches for each other. 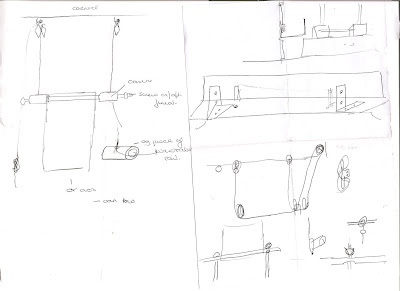 He is making two pulley systems as we speak and they are to be couriered down to me this week. Thanks to www.ironmongeryonline.com we found suitable pulleys. More one the design later. Meanwhile the decorators have made a start on the hall today. Only one small annoyance to spoil two days of quilt viewing and shopping: I went to buy a certain product I shall not identify. I had seen it online with this supplier and it would cost £64.50. At the show they had a big sign - buy at the show and get a 'fantastic gift'. Well who is to say no? I was presented with my gift option (microstitch gun or plastic project bag, neither of which I really wanted that much) and a purchase form with a price which now forget but which was over £80. Huh? I commented that the price was more than online and I'd rather buy it that way for less. Quickly an alternative purchase form was pulled from a table at the back of the stand and put in front of me for the show discount price of £63. Is it just me or is that shabby practice? Isn't a 'gift' something I don't pay for?! Humour is not ony individual but also regional. My sister put me onto this video today and my technological task for today has been to learn how to embed it. Let me know if it is funny all over the world. ( It may help you to be told that Yorkshire is a county in the North of England known for its plain speaking, plain living, money saving people and that Geoffrey Boycott was a Yorskhire crickter of some reknown. ) It is also the settng for such films as The Full Monty and Calender girls. For the first time since - I think- some time in 2006, it was warm enough on Sunday to be outiside. I took the opportunity to park the design board on the patio. Of course, as always seem to be the case, there was not quite enough of the dark brown fabric to do the backing so I chose a second fabric from the stash to add to it. Now, the sensible thing would have been just to add a stripe of the new between two wider strips of the old. Quick simple and easy. But do I ever take the easy way out......? I also took advanatage of the sun to try out sun printing. I quite like this button one but this leaf one is less successful. I like notebooks. I like to have matching sets so it is 'necessary' to stockpile them. For writing I have a set that has lovely creamy pages and narrow lines for my small hand writing. The cover allows me to insert a picture of my own. For my quilting journals ( used for sketches, measurements, shopping lists, inspirational clippings, records etc) I have been using these hefty journals with plain white pages. And so, now you understand my journal fetish you can understand by excitement at discovering an online class by Sue Bleiweiss in which I am going to get to learn how to make my own fabric covered journals. I was enticed to sign up by these photos of just gorgeous products made by other students. I hope I can match up! Also this week I discovered Google Notebooks. (Those of you who found all this stuff last year can you please stop rolling your eyes and cut me some slack here?!) It is not available for Internet Explorer 7 but I was able to download an extension to Firefox which enables a little notebook to be available as you browse the web. You can then drag information into it and make notes. It came in very handy when I was surfing umpteen online shops and trying to compare prices and the best place to buy all my supplies for Sue's class. Another one has also proved a much more sensible place to store several tree of life images I had located by way of research a quilt than simply bookmarking each individual page. Given that you can share these notebooks, I feel another coming on with a list of good quilt related presents to be sent to Dennis in due course! I have been getting pleas for help with Google Reader so here are my best attempts to instruct you how to do it! If any one more competent than me wants to add anything please do comment. Instructions for Firefox first then Internet Explorer. Bear in mind that I can't see your comupter and so if you have problems it might be because your menus are set up differetly to mine - play around a bit! First bear in mind that I am directed automatically to the UK sites of Google – I hope it is not substantially different if you are elsewhere . 1.Go to Google Reader and sign in. Open ana ccount if you need one. If you have a google account ( which you will if you use Blogger) it is the same sign in. 2.In my version there is a link “ Manage subscriptions” Click on that. That will take you to a Settings page. 3.Click on Goodies at the top. Now, check first that you have the bookmarks tool bar open. In Firefox click on View at the top then Toolbars then check the Bookmarks toolbar. Do what it says – drag it to the word Bookmarks. I found that I automatically got a new icon “Next” appearing at the top of my screen. 6.Then do exactly the same thing with the Subscribe button which is also in the Google reader article. 7. Go to some blogs you like. When you get to each of them click the subscribe button. It will take you to the Google reader page and ask you to click the button there to subscribe. Obviously to only need to this once for each blog you read. Note – I have been having problems on and off with this button. If you get a message saying Ooops no feed when you try to drag it try later – it eventually worked for me but now tonight I get the same message again. Meanwhile you can manually subscribe by going into Google Readers and using the Add subscription button and just typing in the blog address to start you off. The wonderful thing is that it also displays comments so you don’t even have to click to see those. When you first subscribe to a blog it shows you several unread entries. ( Unread according to Google Reader that is– you may actually have read them if you have been to the blog directly. Just scroll through them to get Reader up to date with you and next time you will only see new posts. 1. You should have a little orange star on the left side of the browser. Click to open the Favourites center. You need this to stay in place so click the little green arrow to ‘pin’ the list in place. (I vaguely remember in Internet Explorer 6 you do this from a drop down Favourites option in the menu bar. If (as one person who emailed complained) there is no reference to Favourites then I think you may be missing your menu bar. In that case go to The Icon for Tools ( over to the left of the screen) and click. From the menu that comes up you will then have an option menu bar – make sure that it checked. That brings up an Article about Google reader that has a little Next button and instructions to click and drag. Click and drag to the favourites column. Do the same for the subscribe button which is also in the article. In the menu bar click on favourites, then Organize Favourites. Move the Next button and the Subscribe Button you just added to Favourites to the Links folder. Close down your favourites. Now check where on Internet Explorer your Links option is. This is where I spent literally hours trying to work out the crucial next bit – how to get the Next and Subscribe buttons available at all times. If you are like I was the Links option is a little word at the left of the screen with a double arrow. It is useless here! Go to View in the menu Bar, choose tool bars and uncheck Lock Toolbars. This allows you to drag things around. Drag the word Links over to the left under the word File and it should create a new line and show you what is in the Links folder. ( basically if you have the Links word somewhere were it has no space to expand you lose sight of the Next button. Bingo! Two new icons – Next and Subscribe. Now, to read your blogs follow point 8 above. If you do not have either of the above browsers I suggest you get them - just Google them and it is easy to get the free downloads. For those of you into Igoogle pages you can also add Reader to your portal page – but that is for another day! Today I got to go to the Southport Quilters show, held in a church hall. Sadly I didn't think the standard of exhibits was anywhere near as good as their last show, but it is always a pleasure to be surrounded by quilts. (Or maybe that's becuase their last show was the first I ever went you and I have seen more quilts of different types and standards since then? )The group focuses on traditional quilts- mostly it seems made from book patterns, kits or in classes with several quilts made entirely from printed panels. Nothing wrong with that per se but I would have preferred to see more original designs and some art quilts. The best thing of the show was that they had two boxes of The Quilter Magazine for sale at 10 p each. I offered them £5 for the lot as neither of us could be bothered to count them there and then. The result is that I have 83 magazines! However, there are a few doubles and I had the most recent three already. So, I have a proposal. I will swap any three of these for one copy of the recent Studios special magazine produced by Quilters Arts. If you are overseas though I will be sending by surface mail which takes 56 days otherwise the postage outweighs the benefits. The Quilter is not a pattern magazine. It is the official magazine of the Quilters Guild of the UK and contains articles on heritage quilts as well as modern design, art quilts as well as comment and technique / inspiration articles. It currently has 40 pages and some issues have a free magazine inside called Textile Perspectives. Email me or comment if you are interested. If there is ayone in the UK who wants the others I have and can pay the postage, again contact me for details of which ones I have. Meanwhile, my education continues - this morning I downloaded Firefox in which Google Reader works much, much better. Now I understand why that next button is so good. I love how it shows the comments too. And now I am off to learn how to use Google notebooks... and maybe read a magazine or two. Plus - and laugh at my ignorance if you like - I discovered Igoogle tonight. Who knew?! I used to have the plain vanilla Google search page and my home page. Now I have Google Reader, Art Quilt of the Day, Quilts Channel, Bookmarks (the non-favourites version! ), CNN News, BBC Radio, a currency conversion calculator , sticky notes -pictures of penguins and all kinds. At present I am writing this on Dennis' laptop because I am downloading Internet Explorer 7 on mine - I didn't even know I was on an old version until tonight. Look, I know I am not stupid, OK? I just feel stupid right now. But the reason I am sure I am not stupid is that I am smart enough to tell you that I am stupid and need help. Your comments on my last post were extremely helpful (keep them coming). I especially liked this U tube video explanation for RSS feeds that Lisa sent me. It seems that Google Reader is flavour of the month. I can find that. I can even get to the goodies page and the instructions to get the raved about ' next' button and the terribly convenient 'subscribe' button. I can read well enough to see that all I must do is drag the little button to my bookmark bar. But where the ****** is my bookmark bar?! Sorry, I have been puzzling this out for over an hour now. Or not, to be more accurate. Dragging to the little bookmark word on my google toolbar doesn't work. So what am I missing? I think I will get a pencil and paper and write a list of all the blogs I like. That should do it. I am curious about your blog reading habits. Do you have a list that you read every day or do you splurge on a Sunday morning? Do you use an aggregator or type in addresses? Do you surf blogrings lists? Do you have the faintest idea what an RSS feed actually does? I confess I am not as good a reader as I want to be. I have one blog which I log onto every day without fail as soon as I switch on my computer (Oh go on, I'll show favouritism - its this one!). I know about Bloglines and I should try harder with it but somehow it annoys me - I end up opening the blog separately to see it better. So I ignore it for ages then I log on and there are thirty squillion entries to read ( most of which I actually read already because I went direct to the blog). So I guess what I am saying is (a) if you have a more organised method let me know and (b) if you want me to read your blog frequently comment here frequently - a blank message will do the trick! Firstly, thank you for your answers to the last post but you credit me with far too much knowledge. Birthing?! You are talking to a woman who once had to leave a London bookshop and go and sit on the steps in the fresh air becuase I had glimpsed the inside of a book on pregnancy (Honestly). For any one equally ignorant ( is that possible?) I found out what birthing a quilt means here. It being a Bank Holiday weekend here I decided to do some finishing up. I am most proud of this top and and itching to get going on the quilting so I can put in all the leaf veins and so on. It is so far titleless so all suggestions welcomed. Dennis has named the animals - Gerry Giraffe, Francis Frog, Harry Hoopoe and Larry Lizard so I supose it could be called the Fab Four, but I suspect you can do better. I think I will also have a go at it with my crayons after the quilting. So far I have just used a grey to tone down the Hoopoe who was demanding too much attention with his brilliant white feathers and have done a little detail on Francis. I also did the binding and sleeve on Starlight Starbright which was quilted in Penrith at the last class. I think you can just get a bit of the glittery thread on these closeups. It is Superior Threads Glitter which is a holographic thread rather than a metallic. It is very pretty but I had problems with it eyelashing on the back. Polly got diagonal hand quilted rain which is barely visible on a photo and machined feathers and border. then I did two samples of machine quilting for my City and Guilds and two trapunto samples (one hand one machine). ....Sometimes my creativity outstrips my abilty. I started out to make a version of this scrap quilt but using left over strips of green and brown african style fabrics. But, I don't do well following patterns and have ended up with this base for an appliqued wall hanging. I am imagining a large african mask with feathers covering much of the green diamonds. I want to keep it with this jagged edge - but how do I bind it? ....... PS. This little chappy appeared in our urban garden today. One of the reasons I love the internet is that you get accidentally educated. It was suggested that, for hanging quilts on my tall walls, I try the mechanisms used for 'sheila's maids' and indeed these look useful. It was also suggested that I search for systems used in art galleries rather than specifically for quilt hangings. I did so by googling 'art pulley' and stumbled across Heddle Pulleys. 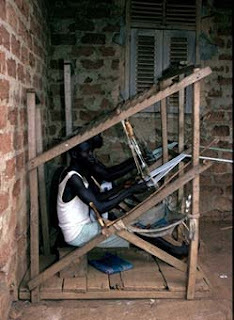 In Africa looms are often used to weave thin stips of textile which are then sewn together. the heddle seems to be the cross bars of the loom and these are linked by a string which runs through ( yup, you got it) a heddle pulley. These heddle pulleys are often carved and highly decorative. Now I want something that nice - ironmongery seems a let down now! You can see more pulleys here and here.